Antalya does not disappoint. This sunny city on Turkey’s southern Mediterranean coast is picturesque, its denizens are friendly, and the food is delicious. This is my fourth trip here, Libby’s second, and my friend Jerry’s first. 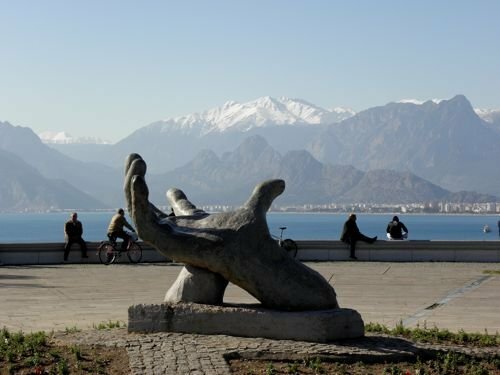 A sculpted hand reaches to heaven beside the Mediterranean and the Taurus Mountains. After landing on Christmas Eve day, we settled into the Atıcı Pension and headed straight out to explore. 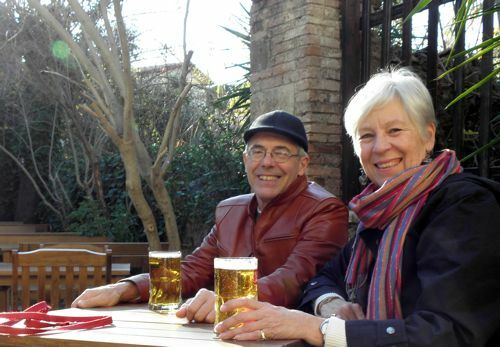 A few blocks down the old city’s narrow, cobbled streets we peeked into a charming little bar, where we couldn’t resist stopping for a beer in their sunlit courtyard—sheer heaven after Istanbul’s morning’s snow flurries. From there our explorations included carpet shops (Jerry finally indulged—surprise), shoe shines, and various culinary delights. 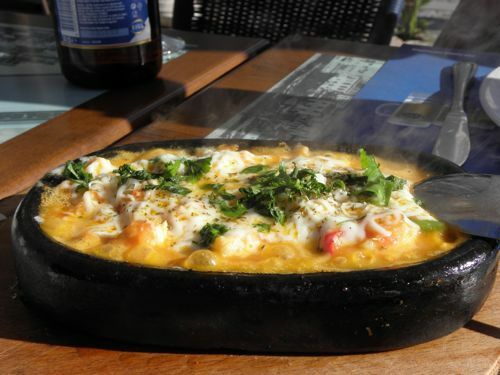 You haven’t lived until you’ve enjoyed a bubbling shrimp güveç–shrimp casserole. Our Christmas Day treat was a boat ride along the Mediterranean shore. Jerry and I reveled at the sights while Libby flirted with a little Turkish boy who plied her with corn chips. They both loved it. 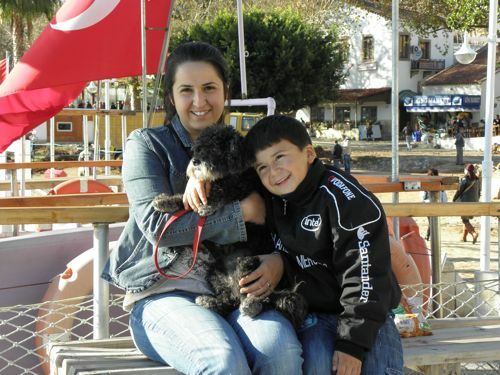 Libby poses with her new young friend and his mother on the boat deck. After a few nights in the Atıcı, we moved to a more central (and more charming) hotel. 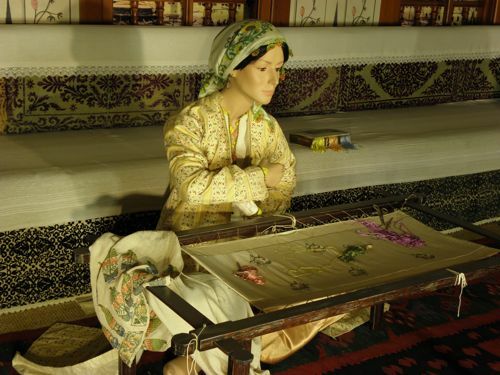 The Abad Hotel belongs to Işmail (as in “Call me Ishmael”), the carpet merchant Jerry succumbed to. He gave us a great rate and has treated us like royalty. 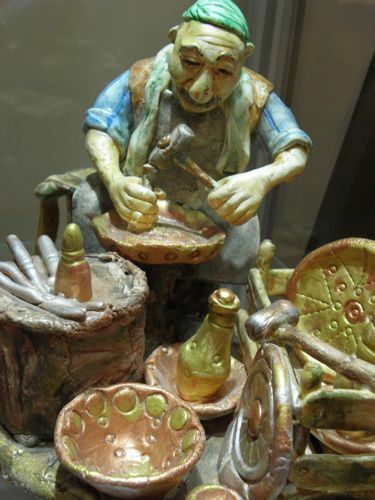 When he learned Jerry wasn’t feeling well, he had his staff brew a special tea for stomach ailments, adaçay—sage tea. We have a spacious room on the third floor with a view of the Kesik Minaret (Truncated Minaret) ruin up the street. 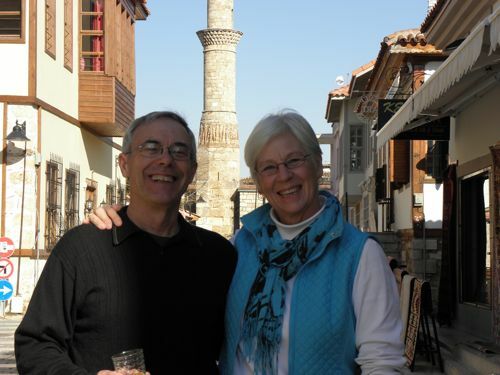 Jerry and I pose outside the Abad Hotel with the Truncated Minaret behind us. 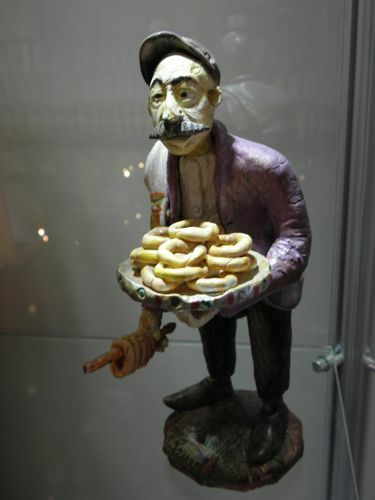 My favorite find here, though, has been a ceramic artist, Sadrettin Savaş. 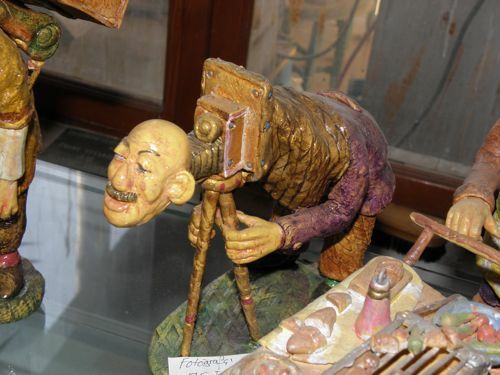 We passed his shop on Saturday afternoon, then on Monday we visited the Suna İnan Kiraç Museum, which featured his clay caricatures of Ottoman street peddlers. 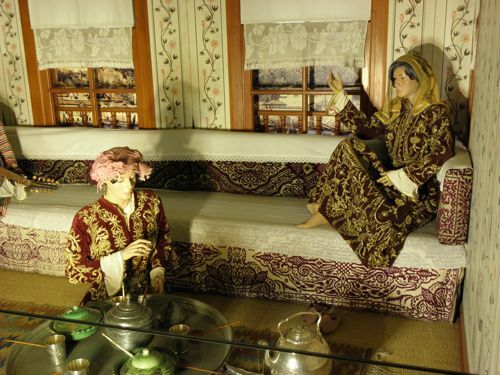 The museum also had a stunning display of typical Ottoman scenes with life-like mannikins in Ottoman dress. Anyway, I visited Sadrettin’s shop Tuesday morning and was thoroughly taken with this delightful artist—and musician. He plays the kanun, a Turkish instrument similar to an autoharp. 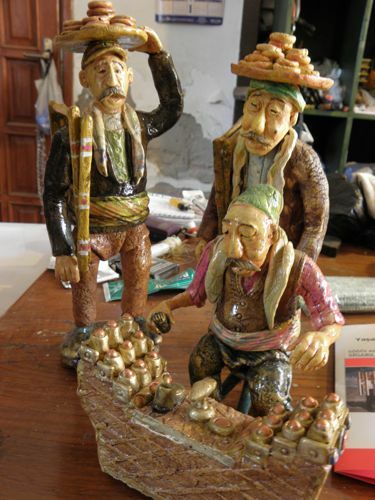 Though my Turkish is sadly limited, we were able to communicate enough for me to understand that although Sadri considers himself an amateur artist, he’s been doing clay sculptures and caricatures for 35 years. Sadrettin relaxes in the showroom off his studio. 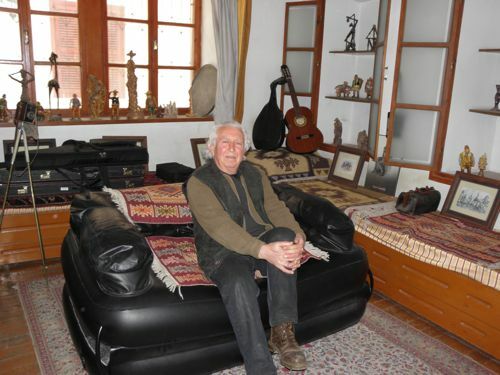 He was born in Eskişehir, a city south-east of Istanbul, about a third of the way to Antalya. 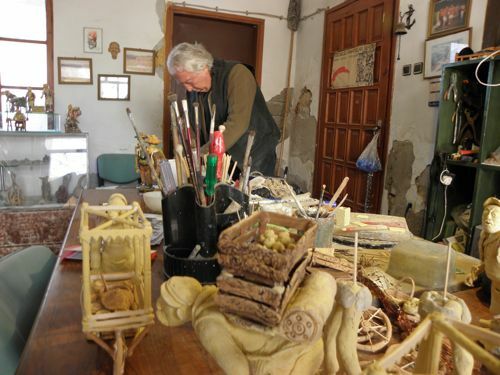 Sadri’s storefront is his workshop, its main room dominated by a vast, high table where he works on about ten sculptures simultaneously. These ten-or-more sculptures are in various stages of completion, each ready for the next painstakingly molded “next piece” to be added. I watched as Sadri molded a base for cart pedestals for one character, a scarf for a second character, and a cap for a third. Though I don’t know all the Turkish names for his characters, I found them all enchanting. and the hamal (porter or carrier). 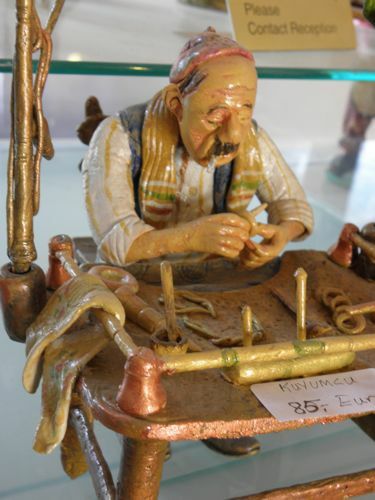 Oh–there’s also the kuyumcu, the jeweler. 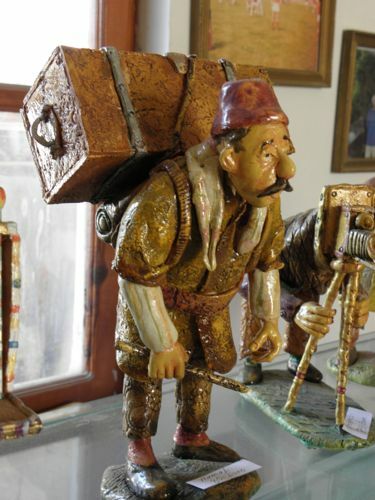 To see a short video of Sadrettin’s sweet sculptures, go to http://www.nelervar.com/G%C3%BCzel%20Sanatlar-ANTALYA!1-8-66-3! There are lots of -ci’s selling things here in Antalya, and we’ve certainly done our part to support them (though we’ve refused far more). My sidekick Libby has made her mark also— as a “kediçi” who deals in cats (kedi). Chasing them. One young kitten jumped about five feet when Libby surprised her. It would have been sad if it hadn’t been so hilarious.